ShadowGram (SG), The Official Newsletter & News Source for Dark Shadows (DS) announces the following breaking news in this Official Online News Update "bulletin." 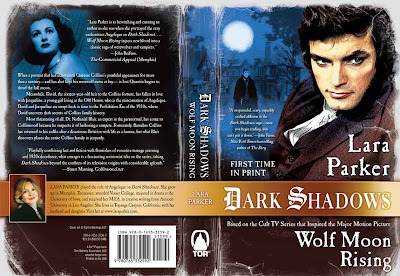 Lara (Angelique) asks SG to announce all 9 of her book tour appearances for her 3rd DS novel, “Dark Shadows: Wolf Moon Rising.” The publication date is August 20, from Tor Books, and the launch is at Barnes & Noble at The Grove in Los Angeles on that date. Lara hopes that many fans will come to each event. More of her comments follow the tour listings below. If it isn't possible for you to come to a book signing, you might call the bookstore nearest you and order a copy to be autographed while Lara is there and sent to you. Following are Lara’s comments about the book and writing it. “I’m very excited about my 3rd book. “It’s a whole new Dark Shadows chapter and it moves very fast,” with three different storylines in two different time periods. For one thing, “Quentin has lost the portrait” that keeps him youthful and his werewolf curse at bay. Now he dreads the full moon. “Everyone is doomed,” Lara said, laughing. “A treat for the fans is the Humbert Allen Astredo character, Nathaniel Blair. He is Nicholas Blair’s brother, and he's a scientist and an expert in the occult. He comes to Collinwood because he suspects a vampire is being harbored there. He wants to find the creature and perform an autopsy!" At the same time, “David Collins is 16 and in love with Jacqueline, also16, an artist – and the reincarnation of Angelique. “There is a lot here for those who loved the show," and the book is dedicated to the Dark Shadows fans. "Whether you raced home from school to miss not a minute or discovered the DVDs only yesterday, if you fell under the spell, this book is for you. “You are and have been loyal and steadfast. You come to the conventions, form groups on Facebook, share in all kinds of social media, and more. “I recently was asked on my webpage if I’m being paid to do this book tour. No, I am not. I’m doing it on my own because I want to meet more of you. I plan to show up at each of the book signings at least an hour early to enjoy being with you." **** “Dark Shadows: Wolf Moon Rising,” will be released on Tues., Aug. 20, through bookstores and online retailers. http://www.barnesandnoble.com and other bookseller websites and sources can ship pre-orders to you or to your local store for pick-up on the official release date (Aug. 20). "A suspenseful, scary, superbly crafted addition to the Dark Shadows saga--once you begin reading you can't put it down." --- John Farris, New York Times best-selling author of The Fury. **** Fans attending any of Lara’s book tour events are invited and encouraged to please send their photos, video footage, reports, local publicity materials and articles, media coverage, reviews, interviews, etc., to SG. Please send hard copies (newspapers, magazines, flyers) when possible and always include your full name, the date, and the complete source name. Lara’s first 2 DS novels – “Angelique’s Descent” and “The Salem Branch” – both were published by Tor Books. Both novels were re-issued by the company last year, in a number of languages and countries worldwide. SG Update # 289 (May 7, 2013) shared her news that her 4th DS book will explore the story of Victoria Winters.